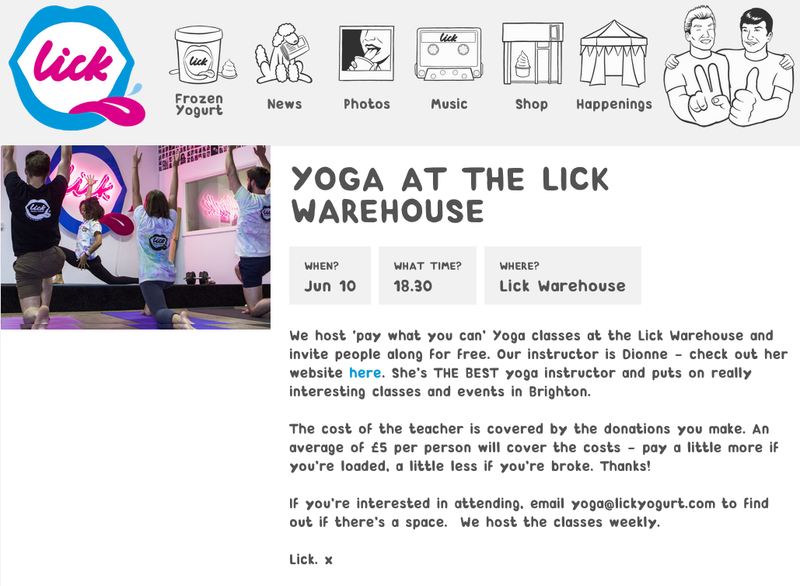 New class: Yoga at the Lick Warehouse, Brighton! (((((Mega excited))))) for this new project! Some of you know i´ve been teaching classes for the good people of Lick and i love what they do in every way. We are opening up the yoga classes for anyone to join and invite you to “pay what you can” – we want it to be accessible to everybody. We start on Tuesday, all welcome whether it´s your first or 50th time. Touching toes is not a requirement. Mats available, just request when you book. Maps and directions below. Hope to see you there! This entry was posted in lifestyle, music, news, schedule, workshops & events and tagged Brighton, brighton yoga, Lick warehouse, Lick yogurt, Nu Shooz, yoga, yoga class. Bookmark the permalink. ← New yoga project starting next week in Brighton!